If any one of the tastes exceeds, it'll definitely spoil your health. Whenever the quantity of the fruit increases, the sour taste will increase. When pepper or chilies is added, that should be in correct quantity. The excess salt will also affect your body health. Method for preparing fruit soup is really very simple. For preparing the tomato soup you just need a medium size tomato or one third of big size tomato. Similarly two tsp full of lemon is for preparing the lemon soup. Two small pieces of tamarind will be enough for preparing a tumbler full of tamarind soup. To any one of the above said three fruits, add 350 to 400 ml of water, a little bit amount of cumin and pepper powder, very small piece of garlic. Boil the mixture for one or two minutes then add 1 tsp of cornflour to increase thickness of the soup. After boiling it, add enough salt and then sprinkle a few cut coriander leaves. The above said fruit soups contain all essential nutrients and anino acids required for our good health. 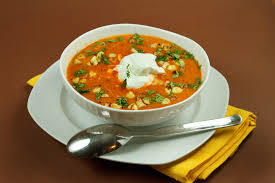 One can easily maintain the body health by drinking the fruit soups for twice in a week.